According to one study, Astralagus root has been associated with a significant age-reversal effect in the immune system, in that it led to declines in the percentage of natural killer cells after six to twelve months of use. 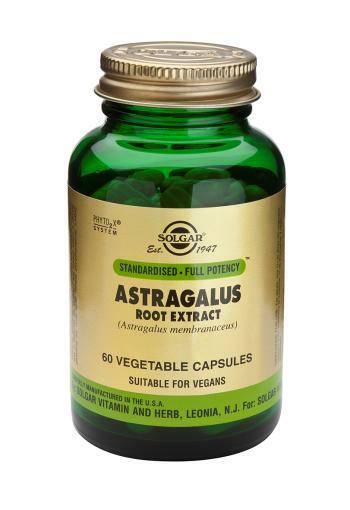 Astragalus Root Extract Vegetable Capsule health supplement is one of Solgar's premium quality botanical formulas containing standardised extracts. According to one study, it has been associated with a significant age-reversal effect in the immune system, in that it led to declines in the percentage of natural killer cells after six to twelve months of use. *Made from vegetable stearic acid. **PhytO2X® is a special blend of natural antioxidants, the purpose of which is to maintain the freshness of the ingredients. Solgar’s Standardised Full Potency™ (SFP) Herbs are developed through a unique process that integrates the ideologies of both traditional herbalism and standardised herbal technology. To ensure consistent and reliable phytonutrient levels, we isolate a controlled amount of these important plant compounds. Then, we blend these enhanced, "standardised” compounds with all of the components that occur naturally in the whole raw herb. The result is a premium-quality standardised herbal extract with all of the synergistic and valuable qualities found in nature.